Capacity of PRT, a freeway lane and two light rail operating scenarios. 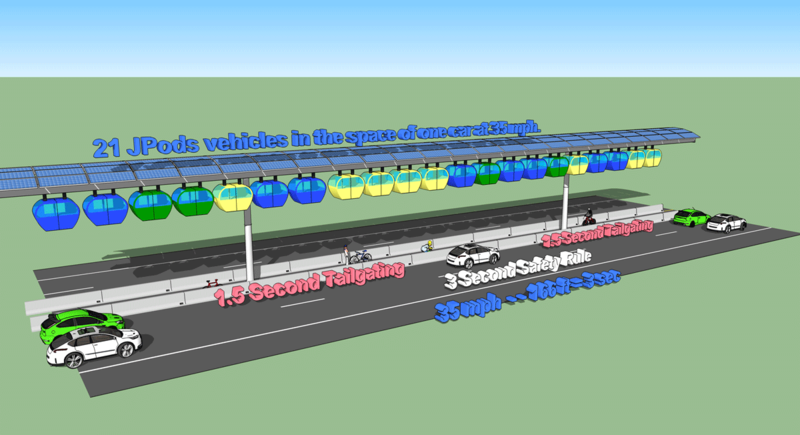 .25 second headway gives each vehicle 3.91 meters of space. Adding multiple rails in the same footprint (6 rails). Six rails is about what will fit in a typical highway tunnel. For instance, Lincoln Tunnel between New Jersey and Manhattan. As JPods networks reduce the traffic, choke-point resources will be allocated to more efficient modes than cars and trucks. At 35 mph there are 15.6 meters/second. A JPods vehicle is typically 2.5 meters long. Giving 3 meters per vehicle, then 5 vehicles can travel per second. There are 3,600 seconds per hour. Assuming the truss is designed to carry the load there can be 3,600 x 5 = 18,000 vehicles/hour. With a typical 4 seats per vehicle then there would be 72,000 seats per hour. This type of heavily loading a single rail would only occur crossing significant linear barriers such as tunnels under rivers. The Lincoln Tunnel between NYC and New Jersey arehas three tubes that carry 113,000 vehicles per day. JPods can fit 5 rails in one tube, or carry 5 x 18,000 = 90,000 vehicles per hour, or 360,000 vehicles per day. This video illustrates the problem with intersections, and in the last part, how self-driving cars solve traffic issues. This video from MIT illustrates the capacity benefits of self-driving cars at intersections. JPods networks have the added advantage of being grade separated. There are no deer, children, or other analog events that affect JPods networks. In this illustration a train empties a couple hundred people onto a platform. Before the train has left the station, about 1/3rd of the people have already left. Within 2.25 minutes, everyone has left. There is a profit, a value above cost, in saving people time and money. JPods focuses on the value and quality of the trip to the traveler. JPods are respectful that the time of the travel is valuable. JPods, like the automobile or elevators, serves the customer on-demand. Small packets stream resource to need more effectively than large batches. In nature delivery systems are streaming. Blood operates with small vehicles delivering needs on-demand and streaming away waste products as they are produced. 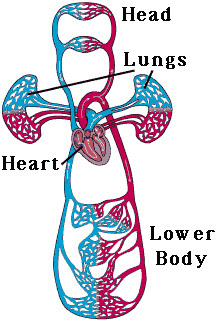 If your red cells had a thousand times their capacity but were twice as large, you would be dead. Size must be tailored to need. Historically the right size packet for move people is feet, horse, chariot, carriage, bike and automobile. The following graph shows the capacity per lane. Year One is on the left and in the left of the second graph. Experience will support headway reduction. As oil-powered vehicles are displaced, access to tunnels and other choke-points are expected to be granted. For example, one tube of the Lincoln Tunnel between New Jersey and Manhattan could be granted. On an initial estimate, 6 rails could fit through one tube of the Lincoln Tunnel. Given that there is station and vehicle capacity, the rail would be capable of 172,800 seats per hour at .5 second headways. This far exceeds the capacity of any other mode of transport. Benefits of shifting from Mass Production to Just-in-Time can be gained by shifting from Mass Transit to Personal Automated Mobility. Manufacturers experienced great productivity gains moving from Mass Production (focus on the capital asset) to Just-in-Time (focus on the quality, continuous flow and value of the process). Reference: Applying Lessons from Lean Production Theory to Transit Planning by Dunning and Richert. Being ultra-light and on-demand, JPods service is available 24 x 7. Capacity is 100% available 100% of the time. Buses and trains have limited capacity often and zero capacity much of the night. How traffic signaling can help with car flows. This need is entirely preempted on JPods networks.